Cheong Wa Dae on Tuesday discovered documents from the former Lee Myung-bak administration that are rumored to contain evidence of links between the government and corporations, local media outlets reported Wednesday. The contents of the documents, found in the office of the presidential secretary for national security, have not been disclosed. But they reportedly concern the construction of Lotte World Tower in southern Seoul by retail giant Lotte Group, and include information on dealings involving a former Navy chief and the defunct STX Group. “The document related to Lotte Group is about their construction consent on the Lotte World Tower,” a Cheong Wa Dae official was quoted as saying by the Yonhap News Agency. While the presidential office told the Korea Herald it could not confirm the content of the documents, pundits view the documents as linked to the construction permit that was granted to the conglomerate long after the request, when the Lee administration took power in 2008. The construction of the 555-meter Lotte World Tower in Jamsil, Seoul, had been a decades-old dream of Lotte Group Chairman Shin Kyuk-ho, who bought the plot of land in 1987. Its construction, however, was only permitted in 2010. The skyscraper project had faced strong opposition from the Air Force, which said the building would hamper operations of nearby Seoul Airport, a military installation in Gyeonggi Province. As the construction consent was made on the condition the runway angle of the airport be tilted by three degrees, the Lee administration then came under fire for possible links with the corporation. No evidence supporting such allegations was uncovered. The STX Group document is thought to contain information about the former Navy chief pressuring the business group in 2008 to offer 770 million won ($687,000) to his son’s yacht company in exchange for business favors. Jung Ok-keun, chief of naval operations from 2008 to 2010 was sentenced to four years in prison. Cheong Wa Dae is believed to be weighing the options of opening them to the public, as the documents contain evidence of previous government misdeeds. “Opinions are divided inside on whether to reveal to the public or to let it be known through prosecutorial investigation,” Yonhap quoted an unnamed presidential officer as saying. It had previously revealed some of the documents compiled by former President Park Geun-hye, found in other offices of the presidential aides, and submitted the copies of the documents as evidence to special prosecutor Park Young-soo, who investigated the former president during her impeachment. The revealed documents hinted at links between Park and Samsung Electronics Vice Chairman Lee Jae-yong, and suggested Park provided backdoor support for a smooth leadership transfer of Lee. The two are currently detained and standing trial on bribery charges. The original documents discovered in the office of the presidential secretary for national security are expected to be transferred to the presidential archives, while copies related to the misdeeds would likely be submitted to the prosecution. The conservative parties that formed the previous administrations have lashed out at the government for leaking information about the secret presidential documents, accusing it of carrying out a political vendetta against the former governments. 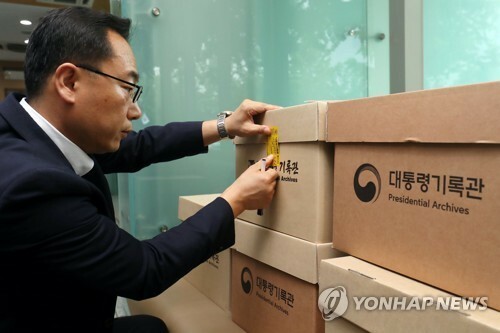 The main opposition Liberty Korea Party filed a complaint against presidential spokesperson Park Soo-hyun on July 19 for violating the Management of Presidential Archives Act, which prohibits concealing or divulging of presidential records without permission.